SAN JUAN, Puerto Rico -- Hurricane Maria, an "extremely dangerous" storm, made landfall on the small island of Dominica Monday night as a Category 5 storm, then weakened ever-so-slightly to a Category 4, the U.S. National Hurricane Center (NHC) said early Tuesday. Maria was pummeling Dominica with maximum sustained winds of 155 mph as it surged into the eastern Caribbean, and forecasters warned it might become even stronger. A series of Facebook posts by Dominica Prime Minister Roosevelt Skerrit captured the fury of the storm as it made landfall on the mountainous island. "The winds are merciless! We shall survive by the grace of God," Skerrit wrote at the start of a series of increasingly harrowing posts. We do not know what is happening outside. We not dare look out. All we are hearing is the sound of galvanize flying. The sound of the fury of the wind. As we pray for its end! A few minutes later, he messaged he could hear the sound of galvanized steel roofs tearing off houses on the small rugged island. He then wrote that he thought his home had been damaged. And three words: "Rough! Rough! Rough!" A half hour later, he said: "My roof is gone. I am at the complete mercy of the hurricane. House is flooding." Seven minutes later he posted that he had been rescued. My roof is gone. I am at the complete mercy of the hurricane. House is flooding. It was the first official word from Dominica after the eye wall moved ashore. The storm was on a path that would take it near many of the islands already wrecked by Hurricane Irma and then on toward Puerto Rico and the Dominican Republic. 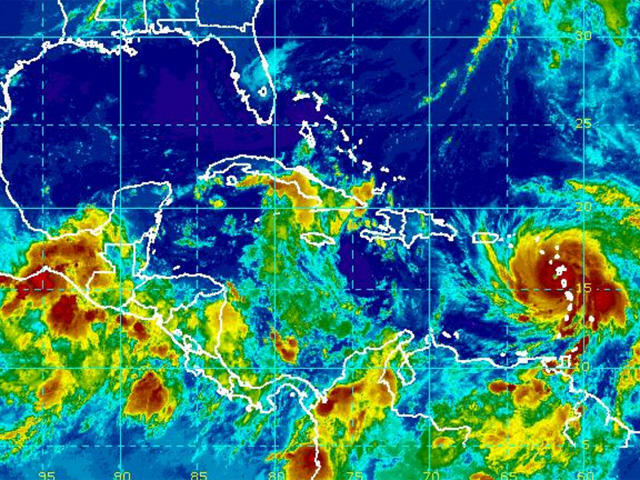 Maria could hit Puerto Rico on Wednesday, said Ernesto Morales with the U.S. National Weather Service in San Juan. "This storm promises to be catastrophic for our island," he said. "All of Puerto Rico will experience hurricane force winds." The NHC's 2 a.m. advisory said Maria's eye was some 45 miles west-northwest of Dominica.and was moving west-northwest at 9 mph. The NHC forecast Maria's eye would move over the northeastern Caribbean Sea on Tuesday and approach the Virgin Islands and Puerto Rico Tuesday night and Wednesday. Hurricane warnings were issued for Puerto Rico, Culebra, Vieques, the U.S. and British Virgin Islands, Guadeloupe, Dominica, St. Kitts, Nevis and Montserrat. A tropical storm warning was issued for Antigua and Barbuda, Saba, St. Eustatius, St. Martin, St. Lucia, Martinique and Anguilla. University of Miami hurricane researcher Brian McNoldy says one key sign of Maria's growing strength is what center forecasters call "the dreaded pinhole eye." Maria's eye has shrunk to 10 miles in diameter -- a smaller, tighter eye makes the hurricane spin faster. McNoldy says meteorologists saw a similar pinhole eye when Hurricane Wilma set a record for lowest central pressure -- a key measure of storm power -- in 2005. President Trump approved an emergency declaration for the U.S. Virgin Islands ahead of Maria, ordering federal assistance to aid the response effort, the White House said in a statement Monday. The action authorizes the Federal Emergency Management Agency (FEMA) to coordinate disaster relief efforts. "FEMA is authorized to identify, mobilize, and provide, at its discretion, equipment and resources necessary to alleviate the impacts of the emergency," the statement said. CBS News' David Begnaud spoke with residents and first responders in St. Thomas Monday. Jacob Bradley, an emergency response technician from Arkansas, said all the critically ill patients are being airlifted out of the hurricane's path. "It's been bad. We've had six people laying in a restaurant because we couldn't get them to a hospital," he said. "I would say it compares to Katrina, definitely, if not worse." Chelsea Cesaro and her boyfriend, Breedy, have been trying to find a way out for two days. "I'm just desperate to get out of there so I'm just trying to be as patient as possible, but it's hard not to give up," Cesaro said. In the French Caribbean territory of Martinique, French authorities have ordered residents to stay home as Maria approaches the island. Authorities said in a statement that all rescue and security services on the island are on standby, including 600 firefighters, 400 police officers and 500 troops. All schools and public services are closed. Residents should shelter in the safest room of their homes and be prepared for power cuts and a disruption in the water supply. In Dominica, officials closed schools and government offices on Monday and urged people to evacuate and seek shelters. "We should not take this storm lightly," said Prime Minister Roosevelt Skerrit. "Let us continue to pray for our safety." Officials in Guadeloupe said the French Caribbean island would experience extremely heavy flooding starting Monday afternoon, and they warned that many communities would be submerged overnight. On Wednesday, Maria was expected to be near or over Puerto Rico, which was spared the full brunt of Irma, although much of the island had its power knocked out. Nearly 70,000 people remain without power, and Gov. Ricardo Rossello on Monday warned of another widespread outage. "We have an extremely weak infrastructure that has already been hit by one storm," he said. "This is going to be a catastrophic event." Forecasters said the storm would dump up to 18 inches of rain across Puerto Rico and whip the U.S. territory with heavy winds for 12 to 24 hours. Officials said the Federal Emergency Management Agency was ready to bring drinking water and help restore power in Puerto Rico immediately after the storm. Rossello said officials had prepared about 450 shelters with a capacity for nearly 68,000 people -- or even 125,000 in an emergency. Schools were cancelled for Monday and government employees would work only a half day. Officials in Puerto Rico imposed a rationing of basic supplies including water and baby formula Monday, saying it is necessary to ensure everyone has access to basic items such as batteries, milk, canned foods, flashlights and other things. It does not apply to gasoline or other fuels. Shelves at many stores were emptying out quickly as people rushed to finalize hurricane preparations. Many posted desperate pleas on social media for help in finding certain items. Officials said some stores already were imposing their own rationing measures and stressed that more merchandise was scheduled to arrive on Monday to replenish shelves. In the Dominican Republic, authorities urged people to leave areas prone to flooding and said fishermen should remain in port. Further north, long-lived Hurricane Jose continued to head northward off the U.S. East Coast, causing dangerous surf and rip currents. It wasn't expected to make landfall but tropical storm watches were posted along the coast from Delaware to Massachusetts' Cape Cod. Jose was centered about 395 miles south of Nantucket, Massachusetts, and moving north at 8 mph. It had maximum sustained winds of 75 mph. Jose is expected to bring rough seas and dangerous rip currents to New Jersey and Long Island's shorelines early this week, CBS New York reported. National Guard officials said Monday that the departure of 100 soldiers in a Buffalo-based military police unit and 30 troopers has been delayed because of Maria as it pushes toward the eastern Caribbean. The New York contingent was set to depart from Niagara Falls Air Reserve Station aboard a military aircraft for St. Thomas, one of several Caribbean islands devastated by Hurricane Irma.